Farm Fresh Bacon simply cannot be beat! Enjoy our bacon at breakfast, lunch, or dinner! 1 lb of melt in your mouth goodness. Can you really ever eat too much bacon? Especially when it's from Eight Plates Farm? This bacon is the bomb!! 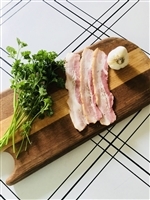 You will want no other bacon once you've tasted the amazing goodness of our thick slice! Cured to perfection for your mouth!